Zach blog tagged me. Because he is annoying... but I thought I would fill out the survey anyway. Yesterday I walked into the office and started sneezing. I�d taken a Claritin before work, but I kept sneezing. I sneezed and sneezed. My eyes became gummy and my vision blurred. My nose started leaking relentlessly. My lungs started to get that burny feeling that reminds me of running a mile for the Presidential Fitness test in high school (when I thought everyone's lungs burned after running a lap and had no idea how they managed it � this is where we thank dad for the smoking and the asthma). My head began to swim, my mind to wander, I blew my nose on an old napkin, and then blew it again. I went to lunch and stopped sneezing. I came back to the office after lunch and started sneezing again. I sneezed and sneezed and sneezed. I stopped being able to pronounce hard consonants. I thought about going home sick. I also asked the receptionist if she might try, as an experiment, wearing a different perfume to work. 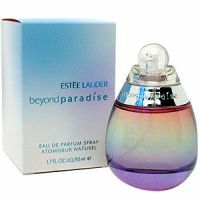 If you want to kill me, I suggest buying large amounts of Estee Lauder�s Beyond Paradise and spraying it liberally around me and everyone I know. 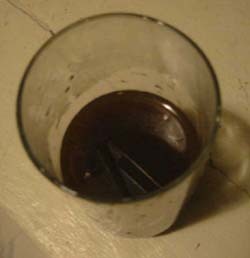 I think that after a few days the reaction should build until I require hospitalization (you think I'm kidding, but I am not) so you�ll have to sneak some in to my room at the hospital to finish the job. Thank you Estee Lauder, for causing the most intense allergic reaction of my life. I would sooner drench myself in used motor oil than your perfume. 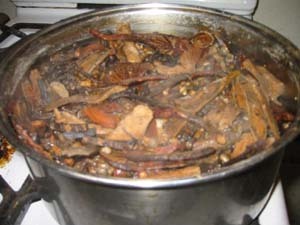 "This is Japanese ramen by way of a Carolina whole-hog barbecue, with more than a soup�on of French technique, deriving its super-porky flavor as much from hot, fatty slabs of succulent Berkshire pork belly and deep-pink shredded shoulder as from the long-simmered stock (made from 70 pounds of chicken legs, roasted pork bones, ham hocks, and bacon)." Sadly in the East Village and not in the San Francisco. I have always had a fondness for lettuce. Mainly the word lettuce itself. Well, maybe not always. But surely since college. A woman fined $173.50 for throwing salad greens out of her car says, lettuce not be too quick to judge her. I stole this photo from Heidi's site. I can't eat gelato, but if I could, I would eat this. 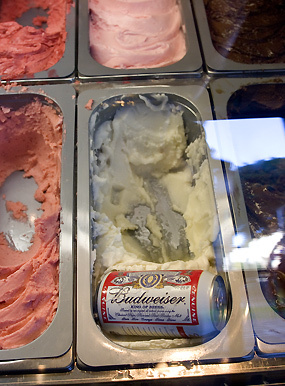 I have to say though, if you put a can of cheap beer just a little too close to a block of dry ice, the result is something like a beer slushie, which on a hot day in the middle of the desert can be an extremely refreshing way to become intoxicated. We just really like Go Fug Yourself and The Superficial when it comes to wasting time. But nothing... NOTHING wastes your time like a visit to Television Without Pity. Thank you interwebs, for your support throughout the long long workday. When a 58-year-old motorist nipped into a German highway rest stop public toilet to answer the call of nature Friday morning, he had no idea how cruel nature could be. Off highway A6 near the town of Lichtenau in Bavaria, which has been experiencing cold weather and snow over the past few days, the man found himself trapped in the toilet stall after the lock froze while he was inside. Because I don't already waste enough time on the internet, I thought I'd finally sign up for Flickr and waste a few hundred hours putting up photos if I can remember to do that. Nothing much to see yet. Next I'll get with LibraryThing which should keep me busy for another 30 years or so. First Lady: I'm just going to steal this piece of meat right here! Second Lady: I hear that, Girlfriend! Third Lady: Join the celebration!! I�m in love with Krakatoa. With Pompeii. With Mt. Pelee, Mt. Saint Helens and Montserrat. With superheated ash clouds and raining shards of boulders. With molten lava when it rivers down mountains and when it steams into the sea. Volcanic tsunamis and especially with pyroclastic flows and their surging clouds of liquid furnace at 70mph. Volcanos are hott. You can�t argue with that. You might think this appears to be a lovely display celebrating winter and the traditional Christian holiday season. 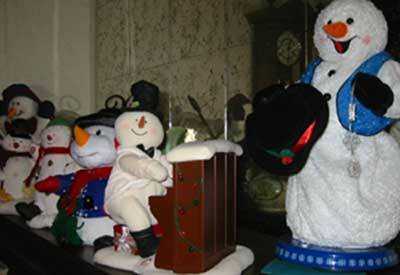 This is an evil army of Satan's own snowmen. Each of these suckers comes to life in song and movement. Some with a button, others with a sneeze or guffaw. It is only by the smallest of favors that my father did not start collecting these while I was young and still living at home. There are no favors anymore. He likes to turn them all on at once, stand back at an appropriate distance to take them all in, and watch these minions of Satan cavort in an animatronic bacchanal of pure and utter horror. Then he'll throw back his head and cackle with glee. 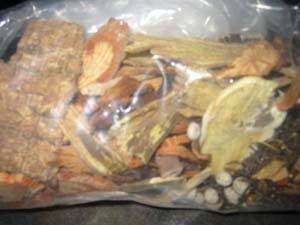 Today I went to the Chinese herbalist (who is not Chinese, but Italian) and got some packs of herbs. Then I went home and boiled them down into tea. Or what I like to call dirt juice. I'll drink some in the morning, and some in the night. In a couple days my knees won't hurt and all sorts of other things will happen in my guts and other internal areas. Bet you wish you had some dirt juice too. I prefer savory to sweet. This shouldn't surprise anyone who knows me. My brother called me just after midnight on new year's eve. He said, "This year isn't two-thousand-six! It's two-thousand Sis!" I thought, hey, this might be a pretty good year. He also said his girlfriend just puked in a trash can. I thought that was pretty funny too.